Please welcome my guest Elisabeth Hobbes to another First Kiss Friday. Today Elisabeth is sharing the first kiss scene from her novel Redeeming the Rogue Knight. We hope you enjoy this excerpt. Happy reading! Lucy Carew is about to go to bed when her night is disrupted by the arrival of two men demanding refuge: the brother she hasn’t seen for years and a mysterious stranger who has been injured. She barred the way, finally revealing her poker and brandishing it like a sword. Lurching forward unexpectedly, he raised his left arm and knocked the poker out of her hand. He staggered, as if this had taken the last of his strength, and fell forward towards her. Instinctively Lucy reached her arms out to catch him, her hands sliding beneath his armpits. She stepped backwards and found herself wedged between him and the wall, his weight crushing her. She yelped in pain as something sharp scratched her left shoulder through her thick wool dress. She looked down to see the head of an arrow protruding from the man’s right shoulder. ‘He’s really hurt!’ she exclaimed. ‘Don’t let me die unmourned, dove,’ the man slurred, his voice deep and husky. Before Lucy could think how to reply he had reached his left arm to the back of her head, tilted it back and covered her lips with his. The kiss took Lucy by surprise, the rough beard scratching at her cheek and lips teasingly, sending shivers through her. His mouth enclosed hers, his lips firm and his tongue seeking hers with a fierceness that left her weak. Her mind emptied as desire lurched in her belly and without intending to she was kissing him back. If he could kiss like this when close to death, what would his touch be like when at full strength? She came to her senses almost immediately and jerked her head away. His mouth followed, greedily seeking her out again, and his good hand slid from her neck down her body, fumbling at her breast. A kiss she could tolerate, but the groping was too much. Outrage surged inside Lucy and now she had her wits about her. He was not the first of her customers who had tried to force attentions on her and was likely not to be the last. Injured or not made no difference. She twisted her leg until it was between his and brought her knee sharply upwards. The man gave a whimper of pain and crumpled on to her, his eyes rolling back in his head. He went limp and Lucy realised, aghast, that he was close to passing out. Her hand shifted against his back and touched feathers. The fletch of the arrow was sticking out. Guilt swept over her that she had done such a thing to a wounded man. She bit her remorse down. She had not asked for her home to be invaded, or to be kissed. He had brought it on himself. She supported him as best as she could, but he was a tall man and broad with it, and was crushing the breath from her as she leaned against the wall. Even by the feeble light of the fire, the man looked as pale as a wraith with a waxy sheen to his brow. His hair was matted to his cheeks. He must have bled from his wound, but against the darkness of his cloak it was impossible to tell. ‘I’m sorry,’ she murmured, reaching to brush the hair from his face. His forehead was cold to the touch and her fingers came away damp with his sweat. He opened his eyes. ‘Do you have wine? Anything stronger?’ he moaned. When injured spy Sir Roger Danby comes asking for shelter at her inn, Lucy Carew is wary. He may be strikingly handsome, but the disgraced single mother has learnt the hard way with men like him. Against her better judgement, she gives him refuge. Elisabeth’s writing career began when she entered her first novel, Falling for Her Captor, into Harlequin’s So You Think You Can Write contest. She finished in third place, was offered a two-book contract and hasn’t looked back! She has since written five novels for Harlequin Mills & Boon with settings ranging from the turbulent events of post- Norman Conquest Cheshire to the thrilling tournaments of fourteenth century York. Elisabeth is a part time teacher and full time mum to two children. She spends whatever spare time she has reading and is a pro at cooking one-handed while holding a book. She loves ginger mojitos and hot & sour soup, though not at the same time. Elisabeth lives in Cheshire because her car broke down there when she was house hunting and she never left. 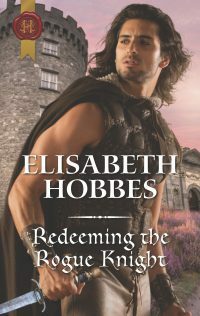 Redeeming the Rogue Knight is Elisabeth’s fifth medieval romance for Harlequin and tells the story of Roger, the ne’er do well brother from The Blacksmith’s Wife. Glad you enjoyed it, Alison, and thanks for stopping by. Wow, that was an amazing excerpt That I really enjoyed! Thank you for being my guest! I love this beautiful cover photo. What happened when Roger kissed Lucy for the first time? Find out on Sherry Ewing’s blog.